Oh the humble banana. It seems most unassuming at first blush, crowded as it is into inelegant bunches lolling precariously on produce aisle shelves. And it appears so banal: a dull yellow exterior with a rather mid-’90s era beige interior (and not even an interesting texture to redeem matters!). Certainly not a looker when compared with the riotous colors seen elsewhere at a farm stand: vermillion, green, purple even! So why exalt this rather lowly of fruits? Things have gotten a bit heavy here on the ol’ Frugalwoods of late, what with my feminist manifesto and all kinds of serious career-related and being-an-adult topics. So I thought we should keep it real with a good old fashioned ode to some fruit. Because honestly, who among us doesn’t devote at least some portion of our day to thinking about fruit? Or snacks?! Do I hear it for snacks? Because a banana is the perfect frugal snack. Ok, yes, admittedly I’ve said these exact words about other things (for example popcorn… ) but today, it’s all about BANANAS. The banana possesses a secret strength: it is the world’s most frugal of fruits. While apples, pears, oranges and the like might tempt and beckon with promises of interior juice and gleaming skins, their price tags match these lavish exteriors at anywhere from $0.90 to $2.00 per pound. Egads! But not the banana. The banana is content to satisfy our hunger for a mere $0.39 per pound (sidenote: this is Stop-n-Shop’s banana price and it’s the one thing they sell more cheaply than Market Basket, whose bananas clock in at $0.49 per pound. Oh yes, I know the prices of bananas all around town. This makes me very popular with… uh, no one.). Your standard banana tips the scales at a dainty 160 grams (aka 0.35 lbs), which yields a per-banana price of the devastatingly low 13.6 cents. I highly doubt there’s any other foodstuff nearly so healthy available for anywhere near so economical a price. In addition to setting a new standard for frugality-while-snacking, a banana comes individually wrapped, with a built-in handle, ready to be carted near and far for lunch or snack or meal. It’s equal parts tasty and convenient to transport, which is key for the frugal weirdo on the go. Long before banana-flavored power bars and bourgeois banana smoothies, there was–quite simply–the banana. All on its own and altogether fabulous. Far cheaper and healthier than anything packaged in plastic, the banana is the original gangster granola bar, candy bar, Graze Box (I cannot even believe this is a thing. And people wonder why they can’t save money. I mean seriously). Furthermore, bananas are our longtime travel companions–whether we’re destined for a mountaintop, a 901-mile roadtrip, or a particularly long day in an airport–a banana is there for us. Of course if you’re concerned about the longevity of your banana on an arduous trip (I mean, who doesn’t lay awake nights fretting about bruised banana skin???!!! ), you can always invest in a banana tote. Oh that’s right, there’s something on the market called a banana tote. And I’ve linked to it twice now because it’s just that ridiculous (how about a third time: banana tote!). Though I don’t own one, I’ll admit the thought has crossed my frugal mind on more than one occasion. There’s something about purpose-built individual produce transit systems that intrigue me. Bananas: not in this picture! Just realized I took this photo without the bananas! Fail! Bananas make an appearance in our lives on a daily basis. Mr. Frugalwoods and I both munch one every morning atop our $0.10/serving oats. It’s the ideal fruitorial compliment to our whole grains and it adds just the right amount of sweetness to the first meal of the day. In fact, bananas pair beautifully with quite a few different frugal feasts. There’s the classic bananas with peanut butter, one of my all-time faves (anytime I can work peanut butter into my day, I’m delighted). And let’s not forget the dessert companions–ice cream, pudding, cake–nearly anything in the pantry can be improved by the addition of a banana. Anchovies and banana, why not?! Ok not so much on that last one. Plus, a banana can be eaten raw with nary a chef’s preparation required (this being crucial for people like me who 100% fail at cooking endeavors). While one could perhaps flambé or rotisserie or even fondue their ‘nana, I rather prefer to chow mine plain and unadulterated, as nature intended (of course peanut butter is an adulteration that nature most definitely intended. Trust me, I write things on the internet). Beyond their culinary merits, let’s not forget that bananas serve other valuable purposes in our lives. What else would we use for our fake telephone? Additionally, they make for a fantastic baby-length measuring mechanism. My baby, for example, currently clocks in at three bananas long. If that’s not a useful data point, I don’t know what is. 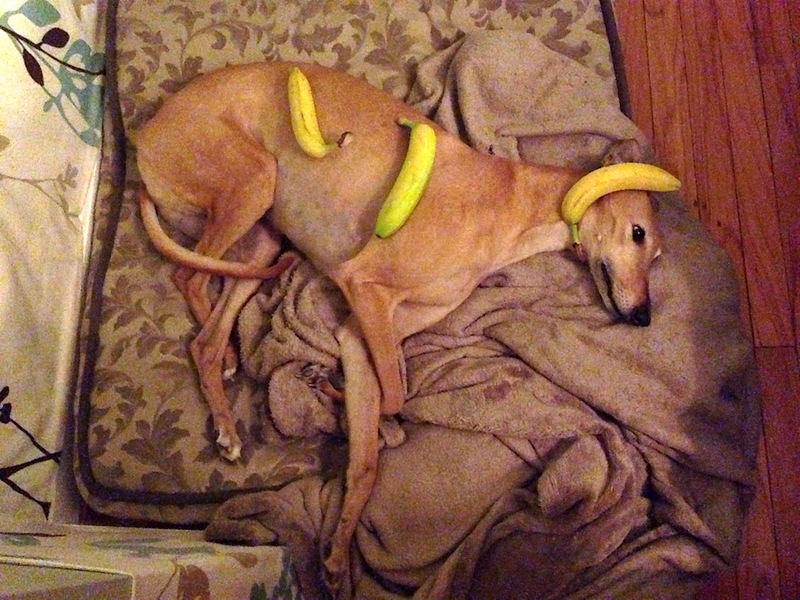 And, of course, bananas are optimal as hats for greyhounds. It’s a well known fact that greyhounds adore both bananas and wearing hats. * Frugal Hound looks simply divine in her fruit-come-headpiece. As an unabashed efficiency maven, bananas appeal to me above all else for their incredible encapsulation of frugal efficiency. Bananas meet the requirements of being inexpensive, terribly healthy, easy to tote, ready to consume at a moment’s notice, and naturally scrumptious. While popcorn may claim the role of perfect warm frugal snack, the banana certainly stands tall as the quintessential frugal produce selection. In all seriousness, although our snacks might seem a small and lowly expense, ’tis folly to ignore even the most ignoble of budget line items. By frugalizing one’s fruit consumption, one can reap the rewards of sweet and juicy bucks saved. So go forth and eat a banana (unless you’re allergic, in which case you have my condolences. Furthermore, do not blame me for banana-related injuries to self, babies, or greyhounds). Urgent edit: following publication of this erudite entry, a number of concerned readers brought to light my gross oversight in neglecting to mention banana bread. I’m deeply ashamed and only hope that this photo of some banana bread I baked will help rectify my standing among frugal banana enthusiasts everywhere. Please accept my profound apologies and know that I am a devotee of bananas in bread. How would you describe your relationship with bananas? Would you say it is contentious or peaceable? What words of advice can you offer for dealing with a contrarian banana? You’ve only forgotten to mention banana bread! The yummy use for any bananas that don’t make it into your adoring person before going brown. Seconded! Banana bread is wonderful banana-y, buttery stuff! This post is bananas. B-A-N-A-N-A-S. Sorry Gwen Stefani. Bananas ARE awesome!! They are perfect fuel for athletes too. As a frugal vegan, my morning smoothies contain 2-3 bananas, a half head of romaine, and other goodies. They freeze really well too! Once they get a little spotted (aka the perfect ripeness), peel ’em, cut in half, and store in a freezer bag. Perfect for smoothies or banana nice cream! Hilarious and true. Bananas for the win! The banana slicer on Amazon was the first thing I thought of when I read the title for this blog post! Silly stuff! Bananas are also great baby portable homemade baby food. Throw a banana in your diaper bag and mash it with a fork at your destination and bask in the glow of your well fed baby’s smile. You must try banan slices on a cheese sandwish! Really tasty if you take hard bread, or “knäckebröd” as we say in Sweden. I was just coming here to mention freezing when they’re over-ripe. My kids are super dramatic about the slightest bruise on bananas, and won’t eat them. When I saw them devour banana muffins recently, it dawned on me that they might be faking the drama so I would pop the offending banana into a freezer bag and save it for muffins. Hmmmm…smart kids! Our lazy method to make banana icecream/iceblocks is to mash the fresh bananas well and put them in individual icecream moulds. It’s been an easy way to use up overripe bananas when they are on special, and all done in one go. I thought I was allergic to bananas as a kid, but I think I just got a stomach bug one memorable time and that made me not Even be able to stand the smell of bananas for hmm, 20 years. Such a cute post, and true though, bananas are definitely worthy of their own post! I also love bananas as a snack to go, for smoothies or as an add-on for the morning porridge ! However cheap non-organic bananas don’t seem very appealing to me. So I spent the extra cents and buy them in the organic food store – sometimes I’m lucky to get the browner ones at a lower price. Some minutes of internet research easily reveals the downside of pesticide intensive cultivation having a dramatic impact on any living being close to the fields and especially the workers on spot. So I’m convinced that the extra (still small) investement is totally worth it plus the extra yummi taste which comes from organic bananas. Evidently you’ve gone bananawoods, but it will be your own apples in Vermont that will have your eye. Yay for Bananas! As a kid I was always called Shannon Bananan. My favorite backcountry ski food is a tortilla (the raw kind cooked), with peanut butter (sometimes Justin’s hazelnut butter, a lower sugar Nutella) plus a banana all wrapped up. Yum! I had boycotted bananas there for a while back when I tried out the Paleo diet so I guess our relationship was contentious. Very sad times. For the many reasons you shared, I wish I liked bananas. But just the smell of one makes me gag violently. And don’t get me started on the texture… Now popcorn, that’s a frugal snack I can get behind! Oh I love me some bananas! I buy 3 bunches at Aldi each time I go (that’s like 20-25 bananas for the un-Aldi’d of the world). Lately they’ve been $0.29 per pound, so about $.10 each, carry the one, that comes to $2 for a large box full of bananas. Bananas can’t go bad in our house. As soon as the yellow wins the duel with the green, the banana is ripe enough for most, and the eating begins. I prefer to sup on my bananas when the black spots taint the yellow with imperfection. If the black overtakes the yellow, that means they are ripe enough for banana bread, or the freezer for future banana bread, or what I call banana ice cream. Mash up bananas, yogurt or milk, and a dash of PBJ, mix, freeze. Boom! Kind of healthy ice cream. Our kids love it. Sprinkle in some chocolate chips and the kids scream “Eureka!” when their pick-like spoons hit a lode of interstitial bittersweet tastiness. I was laughing out loud! We leave on a trip in a few hours. Shortly before reading this post, I had put bananas (for the plane and for hotel breakfasts), peanut butter and jelly sandwiches (for the plane), and instant oatmeal (I know instant is kind of gross but it is much less expensive than hotel oatmeal and you can make it with the coffeemaker in the room for breakfast) on the kitchen counter. The timing of your ode to the banana was perfect! I do wish they did not bruise so easily in the carry on though – I always have to worry about “banana management” on the plane so they are not pureed in the skin by the time we get where we are going. 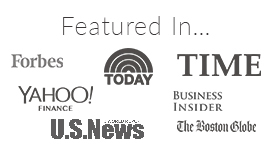 Good morning frugal family! It’s so funny yesterday I was just thinking about bananas. I buy frozen fruit and take smoothies to work instead of buying a meal out. I just began to think that it might be more expensive than I considered. At $9 for a 4 pound bag, it says it has 13 servings. That’s fine but I believe I use more than a serving for my smoothie. Which puts the price up. So I bought a bunch of bananas. When they got a little spotted and sweet I individually wrapped them and put them in the freezer. This actually makes my smoothie cost less, is very healthy and tastes good too! 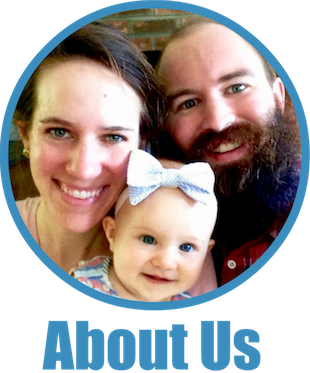 Love your blog, full of humor and good ideas. Thanks for all the hard work you put into it , Babywoods looks adorable, too. Banana skins shine shoes beautifully. We also enjoy banana bread and bananas in our smoothies. I love this post! I love bananas! B-A-N-A-N-A-S. The Market Basket in Reading has the for 39 cents a pound. I tend to shop at that one since I work nearby and it is less crowded than the Somerville one. I hate to be a debbie downer, but bananas are probably going to go extinct due to a disease and the way they are cultivated – https://www.washingtonpost.com/news/wonk/wp/2015/12/04/the-worlds-most-popular-banana-could-go-extinct/ sad face. ahhh, bananas! Love them because the kids love them and they can just grab one without mommy having to wash/peel/cut it! Yay! And, yes, at 0.79$ a pound here it makes it one of the cheapest fruit. And when I’m lucky I get the brown ones from the discount rack at around 0,50$/pound and freeze them for smoothies or banana bread. I’m having a banana in my smoothie I made for breakfast. No bananas from Costco? When I think bananas I think Despicable Me and the minions..
We go through so many bananas at our house! 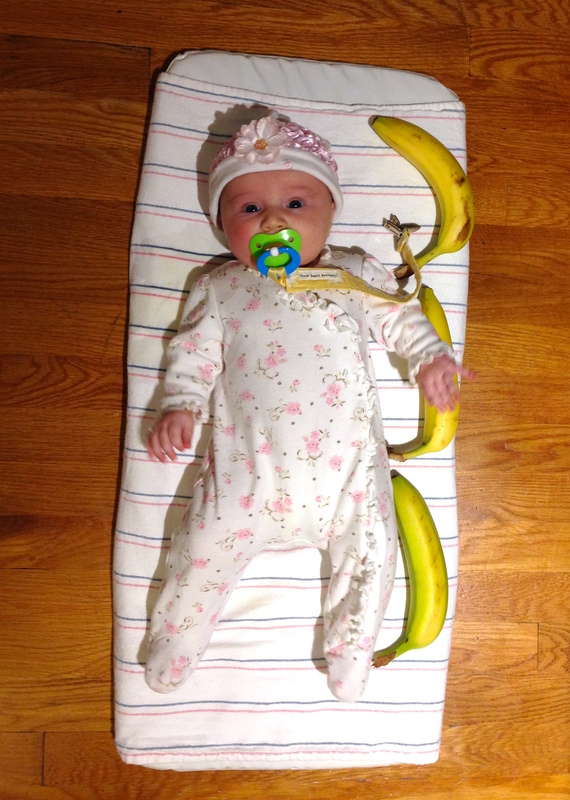 Another thing – bananas are the perfect first food for baby. It won’t be long before you can mash one up for Babywoods! (I can’t even fathom how anyone would ever pay for a little jar of pre-mashed bananas). I totally agree 100% that bananas are the perfect portable snack for adults and also for babies eating solids. We would sometimes carry a banana with a little spoon and when baby was ready to snack, I would peel and gently scrape the side of the banana over and over for baby to eat. No mashing necessary and I can snack on any leftovers. We would also freeze whenever they are getting too soft to use for smoothies. Bananas in our house never go to waste. Ooh- and put frozen bananas in the fruit processor with a little cinnamon, cocoa, or peanut butter and you have a delicious homemade healthy banana ice cream. De-lish! Bananas + peanut butter+ milk + honey + ice in a blender = heaven on earth! What I really want to know is how in the heck you got Frugal Hound to pose for a photo with bananas? My dogs go nuts for them and would have been eating them…peel and all! Over the last few months I’ve been taking my relationship with bananas to the next level. We eat them EVERY. SINGLE. DAY. They’re perfect. We put em’ on our cereal, on our oatmeal, in our pudding; we use them in baking and smoothies instead of sugar. We can’t get enough! And they’re so dang cheap. I’m pretty sure we’re keeping my local grocery store in business because of our extreme banana purchases. So Mrs. FW, your ode to bananas is completely called for. I love bananas! I’m also TERRIFIED of Panama disease, which could wipe out the trusty old Cavendish in Latin America due to monoculture. 50 years from now, we might wistfully tell our grand kids about the “miracle fruit” that gave you 100 calories for ten cents. Until that happens, let’s all enjoy as many bananas as we can! I’m going to second the perfect first food for baby recommendation! The look of delight on our daughter’s face when she first tasted mashed banana was a sight to behold. I would love to see a week’s worth of your meals sometime. I would love the frugal, healthy ideas. I love your blog! I also agree with bananas being a super easy, instant baby food. And kid food, too. Try them – I am being entirely serious – very thinly sliced on a home-baked pizza, ideally one that has a salty-meat type topping, such as bacon or pepperoni. Delish! Also, if your bananas start to go a bit grim and brown / bruised / half-uneated due to baby brain, keep a ziplock in your freezer and heft them in there, peel on or off, and use for banana bread… yes, they will thaw and be mushy and unappealing to look at, but perfect for any cooking use! I have a running ”banana ziploc” on the go most of the time. I also have 3 boys and a tight budget… bananas for the win! I love bananas but these days I generally only use a half of once each day in a vegan protein smoothie. It makes the vegan protein powder more palatable. Bananas are around $1.29/lb here I think. Which is about $0.93 usd. But still much cheaper than apples. Which I think are about $2.99/lb or $2.16 usd. And let’s not forget that it’s a fruit you never waste. Can’t eat them all? Peel and freeze. A little too ripe for your liking? Peel and freeze. Frozen bananas can be used in a multitude of ways. One more reason it’s the most frugal fruit. Sadly, I am the only human banana eater in my home. My little one has decided not to like them. More for me!! I use bananas in smoothies, bread and the occasional ice cream sundae. And when I last purchased them from Aldi they were only .29 per pound! A banana boatload of savings!! mmm, I too love banana and am saddened on behalf of my friends who are allergic to bananas. Banana bread is one of my favorite frugal tricks; I throw those overripe bananas in the freezer and whip up some bread when I want a sweet treat. My only trouble with bananas is that they are easily squished, and I do not enjoy overripe/squishy bananas. I don’t enjoy fake banana flavor either. So I find bananas a little less portable than you do. I’ve debate a banana tote but ultimately just try to be careful with banana placement when I throw one in a bag. My child loves bananas so much that “nana” was one of her early words. Oh, speaking of eating, a word to the wise: introduce veggies first to your kid. Try to hold off on fruit until you’ve introduced and fed veggies for quite awhile. Because once I introduced fruit, it was all over for veggies. I can’t even imagine what would have happened if I had introduced fruit first. For Frugal Banana lovers everywhere…I leave you with this story of horror and nightmares! In my native Australia, Bananas are a staple crop, they’re grown mainly in the north of our hot tropical land…which is also prone to nasty storms and cyclones (opposite twirling hurricanes). One year…many moons ago, there was a huge and devastating cyclone which hit the heartland of the banana growing industry flattening thousands of plants. Immediately (even though cold storage would have had months worth stocked up) prices sky rocketed. At the time I was putting myself through uni and working at a supermarket. The bananas at my store topped $15 (AUD) a kilo!! Occasionally a customer would buy just the one, as a treat..and often that one tiny banana would cost about $2.50. That horror eventually ended…but we still talk about it in hushed tones. I am now living in Wales UK and I’m pretty sure most of the bananas sold here come from South America where it is a lot warmer and sunnier than Britain and they are at around 48p / kilo. Yes I remember with horror the prices of bananas back then. Devastated as I was a follower of 30bananasaday back then. Winter was just dates and oranges, with the rare banana. 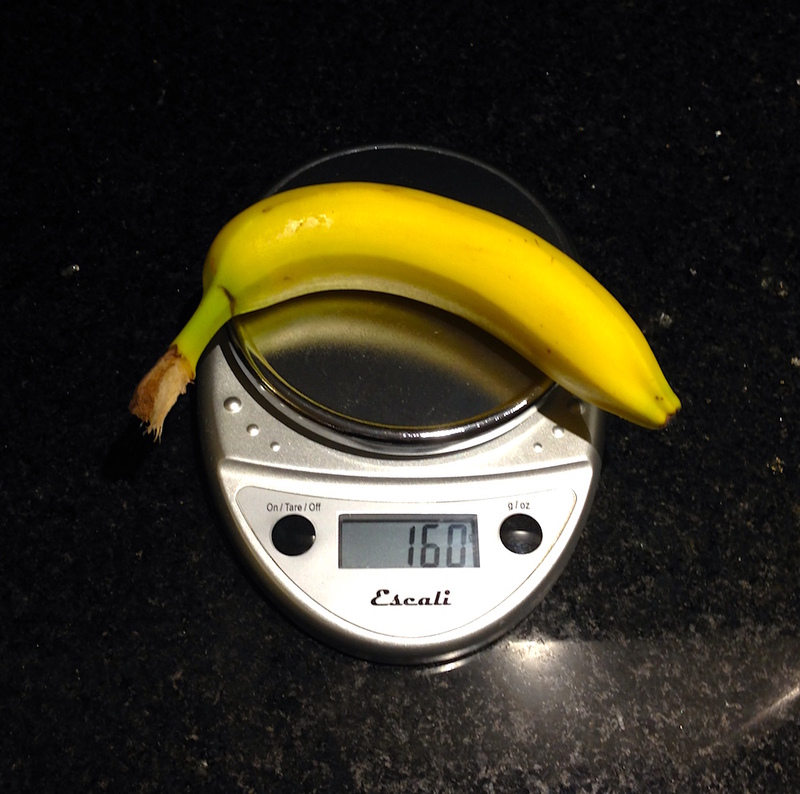 A 10kg box of bananas was $10-15 a few months beforehand – then to $150! All the fruit eaters were having a woeful time. Cyclone Larry. My sister lives south of Coffs Harbour and her extended family has a banana farm. We loooved visits from them extra more than usual because they would bring bananas. Thank goodness someone mentioned banana bread. It’s delicious and so easy to make! Oh Bananas! I have at least one everyday! Love me some nanners! But in all seriousness, I must bring to your attention the current plight of the banana. There is a fungus threatening the banana’s extinction. Horrible and shocking, I know! Give it a Google. I haven’t heard of any end user call to action to save the banana, but I’m sure whatever it is, the frugal crowd is clearly on board. Save the banana!! My parents weren’t big on advice when I left home, me being the responsible financially sound child of theirs, but my mum did say this: always have bananas in the house. So cheap! Yet filling and healthy and tasty. And I have taken that advice seriously in the years since. Mmmm… bananas, with peanut butter! Hurray for bananas. I go through 3 or 4 in a week. I’ll have ’em just plain or in a peanut butter and banana sandwich. I tried making banana pudding last week for the first time. Did not turn out well. And If you believe what Kirk Cameron has to say, they’re proof of the existence of god, since they’re in their own easily-peeled wrapping and perfectly fit the human hand. Then explain pineapples to me, Kirk! Why are there pineapples!? I never was one for eating plain old bananas when I was young (oh, the shame!) but I’ve always enjoyed bananas in other applications – frozen and blended to make ice cream, in bread, in muffins, in oatmeal, fried and on top of pancakes or French toast, I’m smoothies, in shakes, in or on cake or pie, smothered in chocolate and frozen, etc., etc. All hail our banana overlords! Ha! This article has opened my eyes to the many uses of bananas that I had somehow overlooked in my personal adoration of said fruit. Made banana bread yesterday! Satisfied my sweet tooth. I love bananas! I eat one a day. My husband completely hates them and doesn’t even like to watch me eat them (mind you he doesn’t like any fruit really). We love bananas and routinely run out. I have to disagree about their portability though. I find they go to mush and are not great for most kinds of travel. Car travel if they are gently sitting atop something, sure. But plane travel, stuffed in a backpack of purse, toys, books, and snacks? Um, no. But the graze box (and the like), I have always wondered how that is a thing. As my neighborhood is kind of hipster I’ve had several instances of amusement when someone goes on and on about “reducing our carbon footprint” and “preserving our environment” and “helping our planet” … all the while munching on a banana, which, unless you’re fortunate enough to live in the tropics, has to be imported over thousands of miles. Regarding the “are bananas paleo?” debate, most consider it okay since it’s an unprocessed fruit, but because of its high starch content those using paleo to try to lose weight are cautioned to make bananas a hobby, not a habit. With that being said, I’m doing a Whole30 right now, and when I’m absolutely dying for something sweet a milkshake made with half a frozen banana, nut milk and cinnamon hits the spot nicely. I’m a follower of Freelee the Banana Girl. You can eat up to 30 or more bananas a day and still lose weight. It’s all about fruit all the time in any quantities. And Freelee looks amazing! It’s an “eat raw until 4 pm” lifestyle – vegan. Veganism is not for everyone, and there are many, MANY more credible sources about veganism as a lifestyle than Freelea and her boyfriend Durianrider. I agree that there are more credible sources for veganism (like all the doctors who have researched it and endorse it), but eating bananas won’t hurt weight loss efforts – that was the point I was trying to make. Veganism is for everyone – the absolutely healthest option, but most people simply are not open to making the switch. In the interest of not hijacking this thread any further, no, veganism is not for everyone. No one diet is right for everyone. The beauty of living in the first world is that we can eat how we like. I was bored, so I opened up my banana up like this yesterday! Seriously. Hahahaha, this is hilarious. I have actually discovered another use for the banana: the “Am I really hungry?” test. There are a lot of things I tend to eat even if I’m not hungry, but I try to just think to myself, okay, if I had a banana in front of me right now, would I eat it? If the answer is yes, then I’m hungry. If the answer is no, then I’m not hungry. I don’t know how I figured this out or why it works for me, but it does! Oooooh, that is a good one! I’m going to steal that test! I have to hide the bananas from my greyhounds. Love bananas! I bring one to work every day for my morning snack. It’s one of the few fruits that isn’t messy and isn’t loud when I eat it. Not to mention how cheap they are! I’m with you on bananas, they’re great! For anyone who’s interested, one way you can make them last longer is to wrap the stem – it keeps the fruit from releasing its ripening agent too quickly. I use a plastic baggie just for that purpose, the same one each time and I’ve had it for ages. They skins still age as they normally would, but the insides stay nice. I like my bananas on the ripe side, and with this method I can pull a few off every couple of days and always have perfect bananas! I’m with you on Graze Box… Nature Box is similar and it blows my mind that anyone would pay for this. Who needs a “snacking algorithm”? Snacking is easy. I love snacks. I have no trouble shopping for my own snacks. I need an algorithm to help me STOP snacking. And yet they raised $30 million in venture capital to help sell more snacks. How is this possible?!? Who buys this stuff?? My greyhound actually loves bananas! Ruby once snuck out of her gated-off area while I was at work and somehow managed to peel and consume 3 whole bananas I had left on the counter. She didn’t even leave bite marks on the peels! No idea how she did that. Try feeding Frugalhound a peice of banana – I be she’d like it! Baby T loves bananas and typically eat 2 per day. That’s one thing we’re consuming a lot more nowadays. There are some short, fat Ecuadorian bananas that I get at the Asian market that taste so much better than regular bananas! And they don’t cost much more. And don’t forget plantains, the banana’s larger cousin. Plantains can be cooked as a potato-like starch, as chips or if very ripe, as a dessert fruit! Yum! I read this while consuming a banana. I respectfully disagree. Any fruit that you grow yourself is, naturally, the most frugal. Or even better, forage. No startup costs for plants, and you get a lovely hike or walk out of it. I wish I liked bananas, but I can’t stand them. 🙁 But my daughter loves them, and they make a great fuss-reducer on bike rides home from the grocery store, since I can give her a banana as a self-contained snack that she loves. If they start going bad, I do make banana bread. Blueberry oatmeal banana bread, slathered in (real) butter FTW! It’s the only way I can stand to eat bananas. I loved them for over 4 decades, LOL, and then developed a severe allergy. Can’t even smell one if the peel is breached without my throat tingling and my asthma going wild. I miss them. I really miss banana bread. But that’s okay, there’s always zucchini bread, and zucchini can be grown for little to nothing in the way of cost. The problem is getting your neighbors to accept the excess crop! How expensive are graze boxes! And people buy them weekly! I dont like bananas but since you love them you should be grateful you didn’t live in Australia in 2011 when they were costing about $15 a kilo! 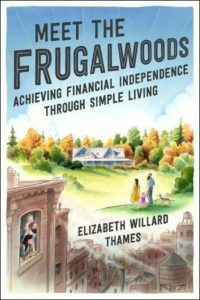 I am amazed at the things Frugalhound lets you do! So funny! I love bananas! I eat ’em every day! Yum. 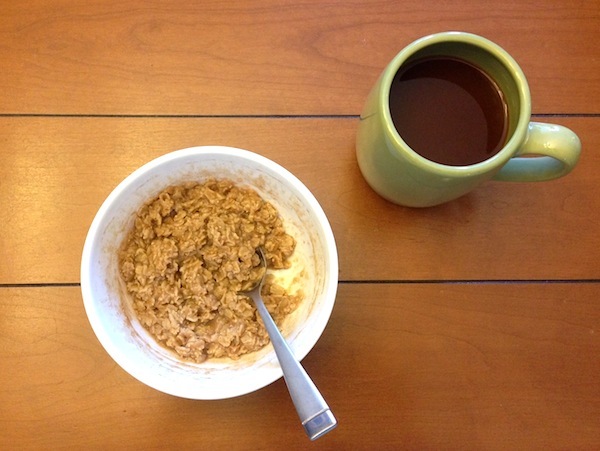 Peanut butter banana oatmeal. I can hardly wait till you get to your homestead. You won’t be able to grow bananas, but the cheapest fruit is free. Here in the farm we grow two different kinds of apples, pears, peaches and walnuts (don’t forget nuts when planting trees). Besides that we grow blueberries, raspberries and strawberries. Blackberries are wild. We also have wild plums. We can’t grow citrus of any kind, nor can we grow edible bananas. That saves a lot of money if you’re into fruit (which we are). We have enough for all winter and some left over to make into Christmas jams and jellies. Actually, bananas are our most expensive fruit! ****I just deleted all my cookies so need to make sure I’m still connected to your blog! Plus bananas are the perfect, totable baby/toddler/kid snack! Back when our son was 2 and was newly adopted into our family, he had difficulty with any food that was firm or crunchy. For the first 3 months he was home, he ate nothing but bananas, yogurt, and Nutrigrain bars. How do you feel about plantains? Growing up we ate them almost daily. Great for breakfast, lunch or dinner. Ahh… The banana! I haven’t eaten one lately because of the many things going on in my life, but I will buy them again when I will ge ready to eat them again! Oh and about the depressing post I posted a few blog entries back, if you remember it, I just want to say I am doing much better now! My aunt bought me this magical salt crystal lamp and I find it is helping with my mood just like the directions said it would! Also, I discovered what I want to be when I grow up! I am also ready to look for a job any day now. I just need some free time to get to the library in order to do that since I only have a tablet. I hope everything will work out for me! Use the inside of skin for hemmoroids(so). Wipe that across sensitive area and complete calmness. In Australia a few years ago we suffered the great banana shortage as a result of a cyclone. My young adult daughter was addicted to the fruit and purchased 5 for $20!! Banana is my favorite fruits of all. And, I like it in fruit shake, combined with some ripe mangoes. I’ve started buying banana’s at their ripest (and, coincidentally, cheapest! ), cutting them into pieces, and freezing them. Works beautifully for fresh fruit smoothies and I haven’t had to toss a dead one in months! Here’s the best recipe I have ever found. Really! Mix liquids with banana. Add dry ingredients and stir only until combined. Cook on hot griddle and enjoy! Options – vanilla, dash nutmeg, flax seed meal in batter. When I was out of something, I have made these without an egg (spoon of yogurt, applesauce, etc. as substitute), or without milk (H2O is fine), or without oil. Thank you! Can’t wait to try a vegan version! I mean, thank you for mentioning the vegan substitutes. See, I love bananas, and we were going through at least a dozen a week. Maybe more. But then the Goblin Chief pointed out they’re apparently super-bad for the environment! Noooo! Something about monoculture and a blight and the economy of Central America. Mr. FP still eats bananas. Then the boys see that we have bananas, and they want some, too. (I do not offer , so their consumption has decreased. But apparently “baby Minions” like bananas, so my children do, too.) So… not sure who I’m benefitting by not eating them… but monoculture! Evidently a bad thing! Lovely to see the banana post. They are a daily favorite in my home too. When my children were little and we were out and about at lunch time, we would usually buy our version of take away food. We called it a Cold Dog, a send up of the Hot Dog. Yes, you guessed it, I’d buy some multi grain fresh baked rolls or buns and a bag of bananas. We would stuff a banana in a roll and lunch away at a cost of about 30c each. Over the years we have tried some variations on this theme: the Green Frog is an avocado in a roll, and a French Log is ham and cheese in a roll. But the firm favorite is the Cold Dog and we always come back to the banana. Just lately, I began experimenting with growing bananas. We are just south of Sydney and others nearby have had some success. They are a really beautiful, huge leaved fast growing tree. Here’s another useful attribute they have: you can wrap fish in the leaves and barbecue it. As a baby I wasn’t a good eater at all and my mum really got desperate at times, as soon as she put bananas in my milk I loved it and I still love bananas today, with porridge or homemade icecream or just as a snack, must check on prices now, don’t think they are that cheap in Switzerland. Ha ha! I see that stolen hospital blanket! They really are the perfect size for swaddling. Frugal indeed. We can barely keep bananas in this house! All four of us each them, so they go quick. I can buy a huge bunch and watch them disappear in less than two days. On the road, you can tell when you are following a group cyclist ride by all the banana peels. Bananas are an excellent source of Potassium which is used up when exercising. So hiking, biking, bring bananas! No one in this house likes brown bananas, and no one likes banana bread, but we do like chocolate protein smoothies made with a mushy brown banana, oats, cocoa, unsweetened almond milk, and dates. I used to hate bananas. The texture got me! But then, I got a stomach bug, and bananas were the ONLY food I could keep down. Now I love them! A good summary of my favorite fruit. Also sliced banana and peanut butter or nutella, possibly on a sandwich… so good. Though I believe it is worth adjusting pricing for peel weighting. I also love apples, which go about twice the price per pound, but I eat nearly all of it. A quick Googling indicates bananas are only about 65% edible by weight, whereas a well eaten apple has to be up closer to 95% edible. That brings it closer to par on price and provides some variety. Amen to the almighty banana! It appears daily in my own kitchen – sometimes standing alone, 3x/week in a spinach, peanut butter, and banana smoothie (what a morning start! 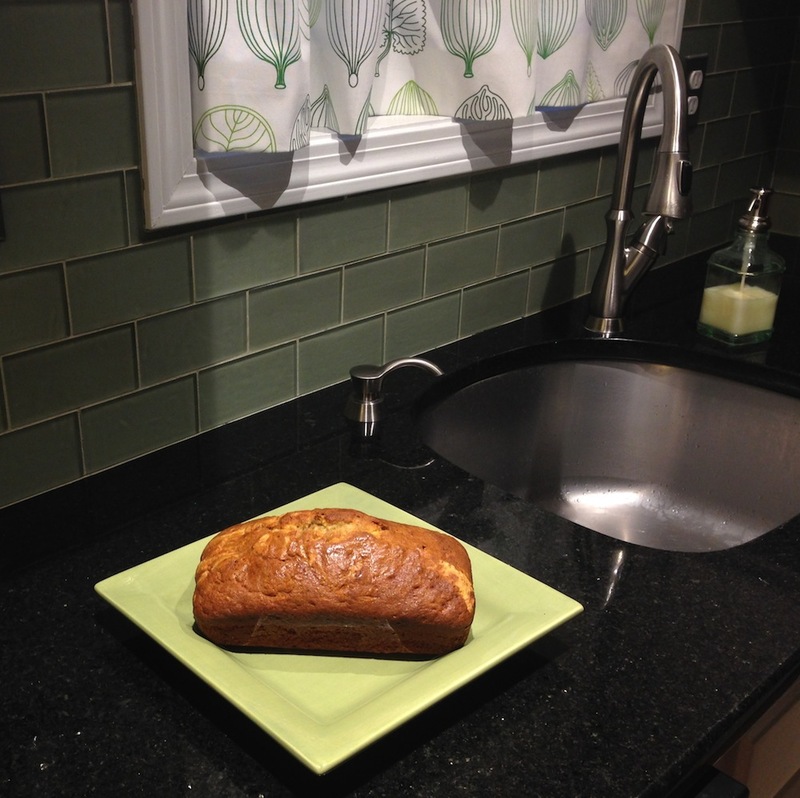 ), and there is currently a 2/3 consume banana bread on the counter. Let’s not forget frozen banana ‘ice cream’. What CAN’T a banana do?! Oh!!! Babywoods 3 bananas tall! Funniest and most adorable thing I’ve seen in a long time 🙂 You just made me LOVE your blog. And have an insane urge to buy cheap bananas. You have just made my mouth water and made me crave banana. I have a very healthy and frugal banana muffin recipe to share with you! In a large bowl mash bananas ( I use my mixer) add the baking soda to that. Bkend well. Next, add eggs, maple syrup, and oil. Mix well again. Then, to the mixter add the cinnamon and while wheat flour. Combine well. Line muffin tin with liners or grease really well. Fill with a 1/4 c. Of batter or make mini muffins. Bake muffins at 350 for 10-12 minutes and the mini muffins for 6-8 minutes. * I added 1T. Of chia seeds for extra protien. SO GOOD AND CHEAP!! !